Is Jeep Making A Huge PR Mistake By Refusing To Recall? - Is your Jeep safe to drive? As I write this, CNN has three different Jeep-related stories on its homepage, sandwiched between “New, risky way to get drunk” and – I promise this next one is true – “She didn’t know she was pregnant.” This, ladies and gentlemen, is today’s hard-hitting news media. Before you accuse me of political bias, I should note that, while Fox News has largely stayed away from the Jeep story, they are currently running a headline that reads: “Pennsylvania prison guard allegedly buys stereo from inmate.” This is poor reporting, because they have not even announced whether the inmate knows about the new, risky way to get drunk. Anyway: back to Jeep. Yesterday, Jalopnik ran an article about the problem, covering both the NHTSA’s stance and the issue itself. But today, I have an entirely different question: is this entire thing an enormous PR mistake for Jeep? For those of you unfamiliar with the issue, let’s go back to the start. 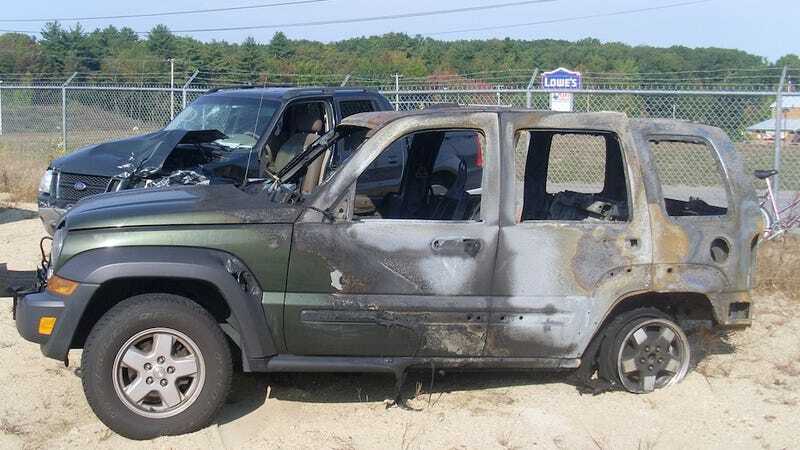 Since 2011, Jeep has been under investigation by the NHTSA for claims that some of its SUVs catch on fire when they’re hit from behind. These claims largely stem from several incidents where Jeeps caught on fire when they were hit from behind. So the two groups are at a standstill, and no one’s sure exactly what to do, but we are certain it will include considerable bureaucracy. Presumably, CNN will report on this with the headline: BUREAUCRACY DELAYS JEEP RECALL OF VEHICLES THAT WILL KILL YOU AS YOU SLEEP. Since we’ve covered the issue itself, I think there’s another interesting angle here. Namely: is Jeep doing the right thing from a public relations standpoint? Consider it: you were incredibly excited to buy a new Compass, presumably for your teenage daughter. You were about to go into the Jeep dealer and offer half the MSRP, which they would probably accept. And then you visit CNN.com, where you discover that Jeep’s vehicles are a larger fire risk than the Ford Pinto. The question is: does this make you want to stay away from Jeep? Is anyone out there going to avoid Jeep because of this story? Will sales plummet? Could this possibly be a worse blunder than the styling of the new Cherokee? But on the flip side, Jeep might be doing the right thing. How many people will this cause to avoid buying a new Jeep, considering the most recent car involved is six years old? Experts say a fix will cost $300 million and $500 million, and it’s hard to believe Jeep will lose that much profit from the bad publicity. Then again, it very well could. After all: by this time tomorrow, the headlines might read: ALL JEEPS EVERYWHERE ARE MONSTROUS KILLERS. And that would be a PR nightmare. So, what do you think? Is Jeep making the right move?